We think everyone deserves delicious everyday Chinese food. That's why we're excited to bring you the second generation Junzi Dining Pass. At junzi, we think everyone deserves delicious everyday Chinese food—because the it is just that good. Seasonal, balanced meals might sound impossible in today’s busy world, but that’s why we’re here. Since 2015, we’ve dedicated ourselves to making northern Chinese cuisine more accessible with affordable, balanced and convenient meals prepared fresh daily. It’s also why we’re excited to share the big news. 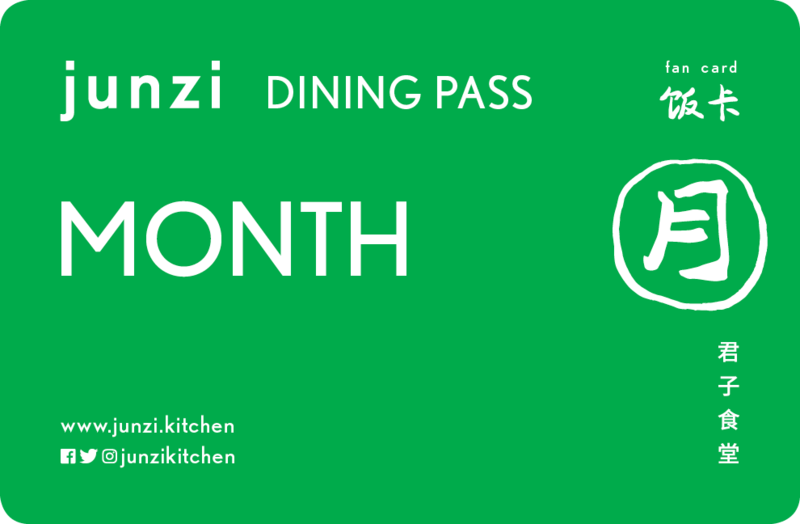 We are excited to bring you the second generation Junzi Dining Pass*. This single card is all you’ll need to satisfy your everyday Chinese food cravings—whether it’s for daily bings, noodles or after hours fried rice. Now available for pickup at all junzi locations. Start your order by choosing a pickup location below. Your card will be ready in just 2-4 business days. Enjoy up to 2 (two) meals a day for 30 days. Each meal can be any one food item plus one drink*. Enjoy up to 2 (two) meals a day for the entire week. Each meal can be any one food item plus one drink*. Enjoy up to 4 (four) meals and save more. Each meal can be any one bing wrap plus one drink*. Enjoy up to 4 (four) meals and save more. Each meal can be any one noodle bowl plus one drink*. Alcohol, merchandise and beverages are not included. Junzi Dining Passes are non-transferrable, and must be used with the card holder’s valid photo ID. Guests must present a valid photo ID of the registered purchaser at checkout. A "WEEK" is defined as 7 (seven) days starting from the day of activation. A "MONTH" is defined as 30 (thirty) days starting from the day of activation. A "SEASON" is defined as 90 (ninety) days starting from the date of activation. Limited to 2 (two) meals a day, one meal per redemption. Minimum 1 hours between redemptions. A meal is 1 (one) food item (bing, noodle bowl or After Hours food item) plus 1 (one) beverage. Extra protein, extra noodles, merchandise, premium teas, cold brews, chips, sides, and alcoholic beverages are not included. Junzi Dining Pass cannot be combined with other coupons, promotions, or special offers. Offer is subject to availability and is not redeemable for cash. Junzi Kitchen reserves the right to change, modify and/or eliminate the promotional policy in its sole discretion. Junzi Bings+ Combo Cards are valid for 30 days after the date of activation. Good for 4 (four) bing combos. Limited to one combo meal per day. A combo is 1 (one) bing plus 1 (one) beverage. Extra protein, extra noodles, merchandise, premium teas, cold brews, chips, sides, and alcoholic beverages are not included. The combo card is non-transferrable, and must be used with the card holder’s valid photo ID. Cannot be combined with other coupons, promotions, or special offers. Offer is subject to availability and is not redeemable for cash. Junzi Kitchen reserves the right to change, modify and/or eliminate the promotional policy in its sole discretion. Junzi Noodles+ Combo Cards are valid for 30 days after the date of activation. Good for four noodle bowl combos. Limited to one combo per day. A combo is 1 (one) noodle bowl plus 1 (one) beverage. Extra protein, extra noodles, merchandise, premium teas, cold brews, chips, sides, and alcoholic beverages are not included. The combo card is non-transferrable, and must be used with the card holder’s valid photo ID. Cannot be combined with other coupons, promotions, or special offers. Offer is subject to availability and is not redeemable for cash. Junzi Kitchen reserves the right to change, modify and/or eliminate the promotional policy in its sole discretion. Contact us at feedback@junzi.us if you have any questions or need any further assistance.